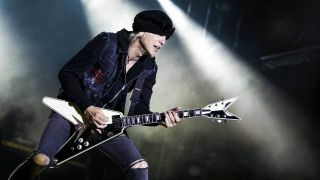 Michael Schenker influenced legions of guitarists since first hitting the scene with the Scorpions and UFO in the 70s, and MSG in the 80s. And he did so by only using his first three fingers of his left hand on the fretboard. If you don’t believe me, pay close attention while viewing his solos on the recent DVD/Blu-ray Michael Schenker Fest Tokyo (also available as a CD), which saw Schenker reunite with the three singers (Gary Barden, Graham Bonnet, and Robin McAuley) he worked with in the ‘80s. Below, Michael picks his five essential guitar albums. When I heard Led Zeppelin for the first time, I knew what to do with the guitar. I started when I was nine, and it was a hit parade - I just copied things from the radio. But when this band came out it was exactly what I liked. First of all, they were all superb. Each one was the best musician in the world, especially John Bonham. He’s my favourite musician, even though he’s a drummer. Without John Bonham, nothing would have happened. But again, without Robert Plant nothing would have happened, either… or Jimmy Page… or John Paul Jones! They had a chemistry you couldn’t make up. It happens. It’s a fortunate thing. When John Bonham died, Zeppelin were done, but they did everything they had to do. There was nothing left to do. They’ll probably stay fresh forever. They sound so original and so emotional and so amazingly musical… it’s just perfect. I was only fourteen years old, didn’t speak any English, and didn’t know any titles. I just went by music. I always listened to a lot of music when I was young, but I never knew what they were singing about. It was always based on sound. So, Black Sabbath - for me - was just based on sound. That guitar sound [sings main riff of the song Black Sabbath] and that dramatic playing, it’s the whole thing. I just love whatever they do. That song itself is such an outrageous song - especially when it came out. It was just amazing. Deep Purple happened in a different way - I was about fourteen or fifteen, and a friend of mine and I heard about this singer singing very, very high. That made us curious. We actually chipped money together and bought that album, and he was singing so bloody high it was unbelievable. Then we discovered the band was amazing.